The Icelandic pieces shared a general tendency towards the conservative and traditional. This was most demonstrably the case in Fimm Skissur [Five Sketches] by Hildigunnur Rúnarsdóttir, composed in 2016 but only now receiving its first performance. Everything about it felt rooted in convention, from the fast-slow alternations of its movements to the language of its lyricism, which veered between cheerful Classical simplicity and a more intricate Baroque tendency. The piece was most interesting in the two slow movements where the music sounded least like an exercise in pastiche. The Andante won me over due to the fastidiousness of its counterpoint, which proved hypnotic, while the Lento exhibited a soft delicacy that was particularly lovely at its dying away conclusion. The rest was simply too generic and impersonal to make any kind of meaningful connection. Ari Hálfdán Aðalgeirsson‘s Gaia, another première, was also characterised by fastidiously-composed material, as if each and every note had been positioned and aligned with the greatest care – though never sounding remotely finicky or theoretical. The piece was occasionally a little withdrawn and perhaps a touch backward-looking, but its lightness was very attractive, as was the nicely unpredictable waywardness it exhibited, which kept sidestepping one’s expectations. By contrast Time in Mind by Sveinn Lúðvík Björnsson was less about intricacy than introspection. From one perspective the piece could be described as noodling, yet it became much more than this due to Sveinn making the music so inward as to feel downright private. It made the act of listening less about the actual notes than the implied thought processes behind them, a kind of sonified ruminating, mulling things over. Time in Mind struck a fascinating balance: musically speaking it was nothing out of the ordinary, always accessible and engaging, yet at the same time it sounded behaviourally strange, perhaps even impenetrable. The combined effect of this balance was quite beautiful. 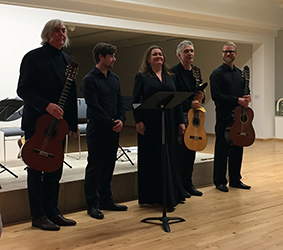 For the rest of the programme the Icelandic Guitar Trio was joined by an additional guitarist, Arnþór Guðjónsson, and soprano Margrét Hrafnsdóttir. In Stephen Dodgson‘s Hymnus de Sancto Stephano, composed in 1983, Margrét emphatically took the lead throughout. Within a heightened atmosphere that fell something short of a ritual yet which was very much more than just a song, her voice was closely followed and carefully supported by the guitars like a small group of acolytes. The brevity of the work (barely five minutes) only added to its distinct air of mystery. The concert opened with two movements from US composer Matthew Brown‘s 2005 The Speaking Silence, setting words by Christina Rossetti. The first, ‘Mirage’, displayed an interesting bifurcated lyricism: regular, almost grid-like rhythmic precision from the guitars, while the soprano’s lines sounded entirely free. Despite this division, the two parts always sounded both connected and complementary, the underlying stasis of the rhythms and harmony creating a floating effect. The second movement, ‘Remember’ (a setting of Rossetti’s famous valedictory sonnet ‘Remember me when I am gone away’), inhabited an ethereal soundworld book-ended by light tapping on the guitar bodies, sounding like soft rain, and characterised by a viol-like effect from two of the instruments being bowed. Brown captured well both the emotion and the solemnity of the words, and though it felt a bit weak towards the end, Rossetti’s words are so powerful they would likely defeat most attempts to do them justice. With amplification, guitars can sound small, particularly in larger performance spaces. Not only did that work to the advantage of the five works in the programme, the Icelandic Guitar Trio clearly opted for extreme quietness in their playing at various points. It was a brave but brilliantly-judged decision, lending the music a tantalising whispering quality that greatly added to the experience. One final thought: this was one of several occasions during the Dark Music Days when the audience was not provided with the sung texts of the vocal works being performed. No concert should ever fail to provide the words in this way, and it’s a testament to Margrét Hrafnsdóttir’s expressive power that, despite this glaring oversight, the gist or at least the tone of the text was usually apparent.